For years now I’ve been hearing from family (my brother) and friends about the merits of the Sonos system. The advocacy isn’t quite Tempurpedic-level cultish in flavor, but it’s close. Give it few years. None of the wide-eyed recommendations made much of a dent, however. Fifteen years ago I’m confident that I would have had a strong opinion on the Sonos, positive or negative. In those days, I was a wanna-be audiophile. It was bad enough that I was a wanna-be in the financial sense – I didn’t have the money for the real high end gear, which you can generally tell apart by how ugly and primitive it looks. Worse, I was a pretender in ability. Because I loved music then as I do now, I was heavily invested in the idea that I needed it rendered back to me perfectly. I researched and bought the best equipment I could afford at the time in an attempt to ensure that studio records sounded as close to when they were recorded in the studio as possible. Live shows, which I have a lot of, as if I was there. Marantz receivers, Paradigm speakers, a Hsu Research subwoofer – it was a lot of money at the time. There was just one problem: I couldn’t really tell the difference between good gear and bad gear. Which meant that I was paying a premium for quality I couldn’t objectively appreciate. This slow, reluctant realization was triggered in part by my transition to digital media: after ripping my CD collection to (ludicrously small) hard drives in the late 1990’s, it was only natural that I began listening to music from the computer rather than my home theater system. And while I’d upgraded the computer speakers, they were not remotely comparable on paper with my home theater setup. But just like the camera you have with you, they had the distinct advantage of being at hand. If you’re interested, there are lengthy debates to be found on the internet about a) whether the physiological design of the human ear is capable of the differentiation audiophiles believe that it is and b) whether they can reliably tell the difference between equipment costing thousands of dollars from equipment that costs hundreds, if that. Personally, I’m not interested. The only thing I need to know about audiophiles is that I’m not cut out to be one. Which helps explain, to get back to the original subject, why I wasn’t terribly interested in the Sonos in spite of all of the enthusiasm. I stopped caring about audio equipment over a decade ago and didn’t much intend to start back now. 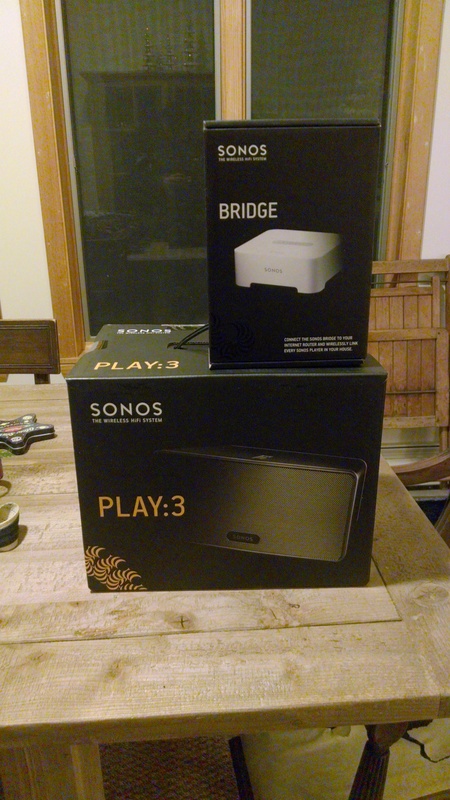 Then my brother got me a Sonos for Christmas. Specifically he got me a Play:3 and a Bridge. While I’m sure Sonos will tout the quality of its speaker systems, the real calling card is the Just Works quality of the network integration. You connect the speaker to your network, or in my case the wireless bridge, and you can play your music, along with a variety of third party services, wirelessly with zero effort. Even better, it’s modular. You can set up Sonos devices in various areas – living room, kitchen, TV room – and push any combination of local media and services such as Pandora to any combination of those rooms. The appeal is obvious, even for someone who’d given up on stereo tech. Convenience, as ever, is a killer feature. Even now I’m not sure I would have invested in Sonos without the push from my brother; the upfront capital costs of the entire system would be discouraging, as the bulk of our available capital is currently allocated to home improvement. But with the initial purchase out of the way, I can easily see us expanding from the dining room (where our unit sits now) to the kitchen, living room, bedroom, maybe even the basement. Some of you are probably reading this and thinking, “Why pay Sonos when I can just connect a home media server to my home theater system via an RC cable?” Good question, as that’s exactly what I used to do. For me, however, the answer is time. Given time and effort, I could duplicate the functionality, or most of it, using off-the-shelf stereo components, an old server, VNC and some ethernet cable. But then again, I pay Dropbox so that I don’t have to (poorly) replicate it using cron jobs and rsync scripts. Sonos isn’t the only way to push music around your house, but it’s almost certainly one of the easiest. Once upon a time I had more time than projects to tinker on. Today, that ratio has flipped so completely that my vacations are spent working on the projects that I can’t get to when I’m working. As such, the Sonos has a lot of value to me. Might be it does for you. Clients: Sonos doesn’t support, at least as far as I can tell, a Linux client, but with Android, iPad, iPhone, OS X and Windows, they have most of the bases covered. Setup: Setup was surprisingly easy. Plug the Bridge into the router, press a button and it’s configured. The Play:3 was even more interesting. It somehow got itself onto my encrypted wireless network without my ever providing it with the password. I assume it was assisted either by the Android device I configured it with or the Bridge but either way, I’m curious. Sound: As mentioned earlier, I’m no audiophile, but the sound quality is very good, even at higher volumes. Library Updating: The process of integrating a music library can be less than intuitive, particularly if – as I do – you store your music in a separate directory from your iTunes library file. NAS integration: Sonos does support integration with NAS devices, but it’s a heavily manual process. Would be nice to see them work with vendors like Synology who supplies the box we use here. Service Portfolio: While Sonos has covered a lot of the bases here with Audible, Last.fm, Pandora, Rdio, Spotify, etc, there are some obvious holes like Google Play (though this app is a decent workaround) and iTunes Radio. Based on the politics involved there, it might be a while. User Experience: Literally. Sonos does a nice job with the out-of-the-box user experience, but their UIs are, in general, not attractive, and usage is a bit awkward.